Our first regional this year was the first ever Iowa Regional right here in our home town. It was a week 4 event and we were ready and excited to compete. After qualification matches we were ranked 2nd with a ranking score of 31. We were picked by the 1st seed, 5172, and were joined by 1208, and won the event which qualified us for Championships in St. Louis! Our founder and coach Mr. Swartley won the Volunteer of the Year award for his dedication to our team and helping plan the regional. 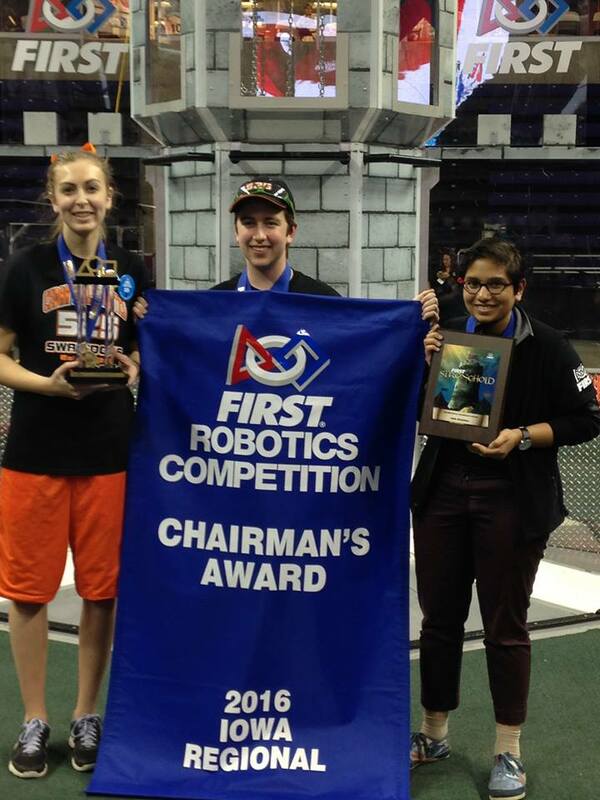 Our team was also honored to receive the Regional Chairman’s Award! Before the event, we were joined at our build site by 3 Chinese teams. We had the honor of showing them around our school and leading them in a couple of workshops to get us ready for the regional. This year, for a second regional, we went to Minnesota 10,000 Lakes Regional again. After practice day we figured we would be facing heavy defense throughout the competition, however the defense seemed to back off once qualification matches started. On Saturday morning after qualification matches started we ended in 2nd place! 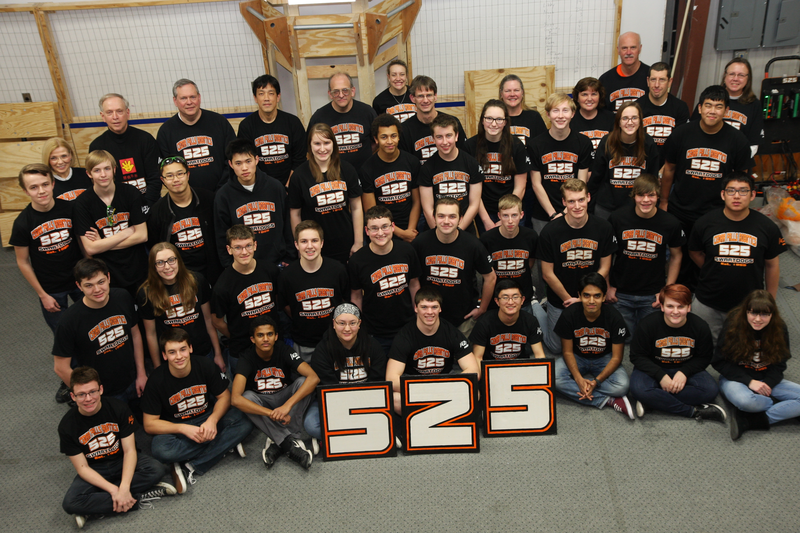 We were lucky enough to be picked by the 1st seeded team, Team 2052 Knightkrawler. We then selected Team 3018 Nordic Storm. We won both of our quarter final matches and won with a tie breaker in semi-finals! After our alliance got a few bugs ironed out we ended up winning our second regional this year! In addition to winning the regional we were honored to receive the Motorola Quality award for our consistent and well functioning robot. Because of our success at both of our regionals, we qualified for World Championships. We were very ecstatic to just arrive but we also performed really well. Because of receiving the Chairman’s Award at the Iowa Regional we got to present to the judges at Worlds and that was a very amazing experience. We ended up being chosen by the 7th seed Team 1619 Up-A-Creek Robotics. We then asked Team 3352 The Flaming Monkeys and 4028 The Beak Squad to join our alliance. We made it all the way to the semifinals in the Carson Division which is the farthest we have made it since 2008. In October, the team traveled to Lee’s Summit, Missouri to compete in the annual Cow Town Throwdown, hosted at Lee’s Summit High School, by Team 1730, Team Driven. Friday afternoon, 28 of our team members arrived at the school, ready for the first day of competition. We ended the qualification matches with a 4-5 record, many of which were extremely close games, and were ranked 22nd out of 50. 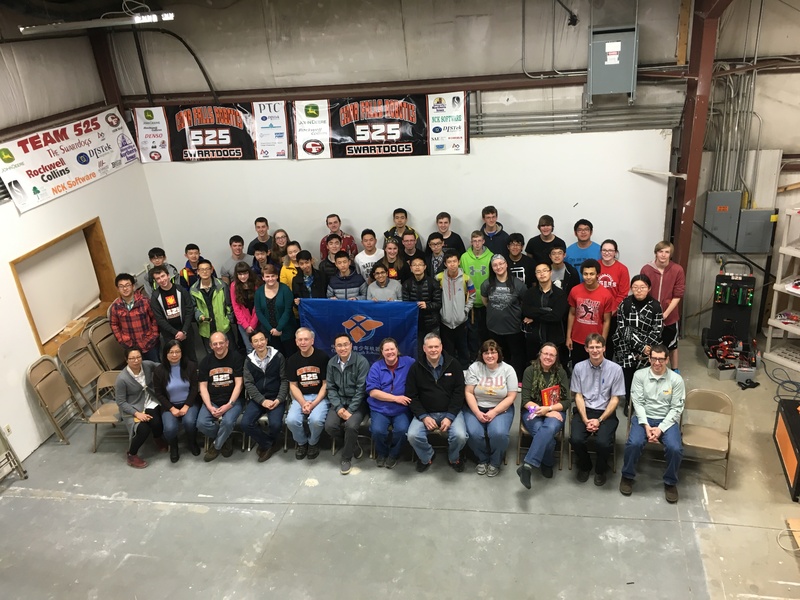 We were fortunate enough to be picked by the 2nd seeded team, Team 3284 Camdenton 4-H Laser. We then picked Team 1094 Channel Cats, and finally 1108 Panther Robotics. We won both quarterfinal matches and then proceeded to win our semi-final matches as well. There were three very competitive finals matches, but in the end, we lost by five points to the top-seeded alliance. However, we did no go home empty handed, as we were lucky enough to be nominated by the other teams at the competition for the “Driven” to Succeed award, recognizing us for our overall effort in the competition, based on our robot’s design, our team’s effort, and our members’ gracious professionalism. This year’s game is FIRST Stronghold. Points are scored by crossing defenses to get to the other alliances “courtyard”, and scoring boulders in the castle. In addition to scoring points, alliances wanted to earn as many ranking points as possible. This is what the seeding was determined by. An alliance got 2 ranking points for a win, 1 for a breach (crossing 4 of the 5 defenses twice), and 1 for a capture (getting the towers power down to zero and having all 3 robots surrounding it at the end of the match). Robots could also choose to scale, or climb, the castle at the end of the match for additional points.